GoodReads Summary: In the follow-up to the well-received Animal Poems, Pug: And Other Animal Poems examines a wide range of animal behavior, from the fleetingness of a fly sipping spilled milk to the constant steely presence of a powerful bull; the greedy meal of a street rat to a cat's quiet gift of a dead mouse on the doorstep. Steve Jenkins's bright collage art brings these small moments to life. What I Think: The summary of this book talks about a dead mouse on the doorstep...and that's literally what Steve Jenkins depicts for the poem Mouse. I almost jumped out of my skin when I turned to that page. There are a few other moments in this book when Jenkins' artwork brings Worth's poetry to life that made me squeamish. What I actually love about all the squeamishness (and the non-squeamish pages, too) is that all the poems are based on animals and what they really do. Throughout this book, I found myself connecting with so many of the things that were happening. For example, in the poem Dachshund, she talks about how a dachshund doesn't have anything to really support his or her back...and my neighbor has a dachshund and is always worried about her dog's back because they have so many back issues. I know it's simple, but there are so many moments like this throughout the book where kids will be able to connect to real things that they have experienced. Worth doesn't focus on the things we love about animals...she has poems about titled Fly, Cicada and Opossum. I felt like I was reading the non-fiction books like Guinness Book of World Records that kids love to look through, pointing out all the gross things and squealing over what they see. 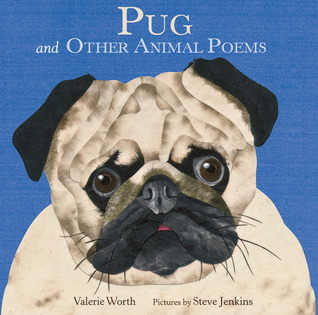 Worth and Jenkins make that happen with a poetry picture book. There is nothing better than creeping kids out...except maybe kids seeing a teacher creeped out. Which means I love this book even though it some pages literally make my skin crawl! I would definitely pull poems from this book to use as mentor texts. Most of them are short but Worth packs a lot of great description and literary elements to look at even within one poem. I think it would be great fun to read aloud a poem and let kids soak in the description and visualize and then show them the picture and read it again. A great book to use for descriptive writing. Writing Prompts: Think of the grossest, weirdest thing you have seen an animal do. Describe what you saw using your five senses and other literary elements to build a clear picture for your reader.